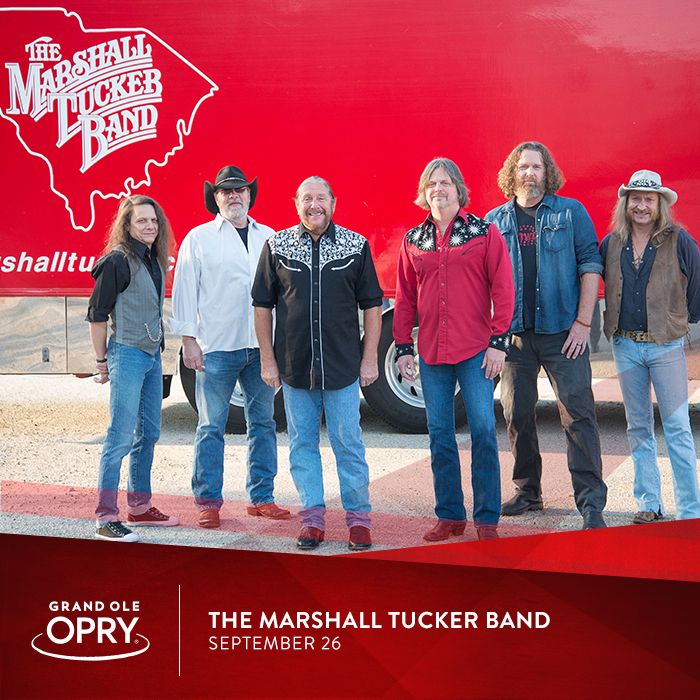 On Tuesday, September 26, for the first time in nearly five years, legendary multi-platinum selling southern rock group The Marshall Tucker Band (MTB) returns to the Grand Ole Opry stage. "When we made our debut on the Opry stage in 2011, I remember it being one of proudest moments of our career," says MTB lead singer Doug Gray. "It's been awhile since we've had a chance to visit again so you can imagine how excited we are to return to the stage that made country music famous!" The night's lineup of talent also includes Rascal Flatts, Lorrie Morgan, Dailey & Vincent, William Michael Morgan, Carlene Carter, and more to be added. The Tuesday evening Opry show starts at 7 PM with tickets available for purchase at the box office or by visiting opry.com. The Grand Ole Opry live radio broadcast can be heard on 650AM WSM as well as SiriusXM (Channel 59). The MTB's Opry performance is one of many stops on its 2017 "45th Live in Concert" tour.